Degenerative disc disease (also known as DDD or degenerative disc disorder) is a very common cause of neck and lower back pain, it is often related very closely to spondylosis. It is often characterised by the degeneration of one or more of the intervertebral discs in the spinal column. These spinal discs are soft, cartilage type tissues that act as shock absorbers in the spine whilst separating each bone that makes up the vertebrae. These discs aid in the movement of the back, including twisting, turning and bending. Although this condition can occur anywhere in the back, the most commonly affected areas include the neck (cervical region) and the lower back (lumbar region). 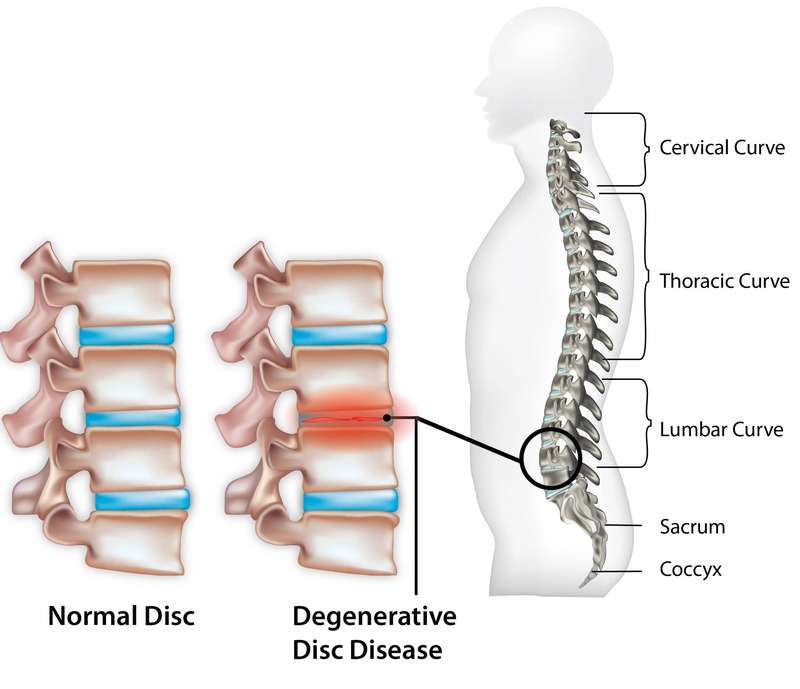 DDD (degenerative disc disease) is usually a long-term pathologic process that can cause acute or long-term back pain in an individual especially if it is not treated in time. Although disc degeneration is not common in young adults as it is a disorder that occurs due to the aging process, it can affect the day to day activities of an individual and reduce their overall range of movement. The pain experienced may also prevent certain normal actions from being performed e.g. running, swimming, bending to pick up an item. Will the pain get worse as I age? Will the condition become crippling and will I end up in a wheelchair? Would the need for surgery be inevitable? Will I have to quit sports and activities indefinitely? Will other spinal discs be affected by the disease? DDD (Degenerative Disc Disease) is a common condition that affects many people, with its main cause being related to the aging process. Due to the general wear and tear of constant use, as we age, the spinal discs naturally start to erode leading to degenerative disc diseases in the long term. Lifestyle – the chance of degenerative disc disease is increased in those with certain lifestyles, such as those who smoke, are overweight or are in a job that required heavy lifting. Many people can have degenerative disc disease without knowing and although the degrading disc may not cause any immediate problems, for some the pain becomes very unbearable and affects their day to day life. It is said that the pain is due mainly because of inflammation and instability of the affected discs, due to the altered biomechanics of the back as a result of the degenerated discs there is a possibility of increased muscle spasms. Radiating pain in the lower back (lumbar region) or neck (cervical region) after prolonged sitting. As the vertebrae and nerves in the spinal column are very closely intertwined, any change in the spacing of the discs and vertebrae can increase the risk of nerve irritation, which in turn can cause other spine related conditions. As the symptoms or pain experienced from this condition differs from person to person it is advised to confirm a medical diagnosis to understand the underlying cause of DDD, as pain may not be an accurate indicator or the level of disc degradation. The diagnosis of degenerative disc disease is usually carried out by a qualified doctor or chiropractor through a physical examination and questions to determine the spinal health of the individual. The doctor is likely to check the range of lower back movement, flexibility and any indicators that may suggest that the spinal nerves are being affected. A look at your medical history may also be conducted with some questions asked, including when the pain first started, when it is most uncomfortable, what relieves the pain etc. Most medical specialists agree that improving back strength and flexibility is usually the best way to reduce back pain. Blood flow from regular exercise helps to oxygenate the surround muscles and tissues whilst removing any waste products from inflammation. Although there is no way to stop the degradation of your vertebral discs as you age, effective conservative treatment can help to either slow the process or reduce any pain experienced, improving the overall management of the condition in the long term. Surgery – this is usually the last resort, and only occurs when all other conservative treatment options have proved to be ineffective or the pain is unbearable. The process usually involves the replacement of the degraded disc with an artificial one. Another surgical procedure would involve spinal fusion. Mobilization – this involves specially formulated procedures to improve the range of movement of the back and increase overall back strength. The injury is normally first identified by its symptoms, such as the pain radiating from the affected area, which is usually the main cause for seeking treatment for degenerative disc disease. By reducing inflammation and other related causes, this can help in reducing the pain experienced. The physiotherapist is most likely going to recommend a range of treatment types from ice packs and massages to acupuncture and even adhesive tapes. All these alongside the use of NSAIDs are usually the first step towards successful recovery. As the inflammation and pain starts to subside, your physiotherapist is likely to move towards exercises and movements to restore your normal back function through range of motion and muscle strengthening techniques. A treatment plan to work on core stability may be recommended especially as it helps in [providing more stability to the spine and mid-lower back. Intermittent stretching and massaging of the affected area may not help directly with the degenerating discs but can help in strengthening the surround muscles, putting less strain on the vertebral discs. As the dynamics of the back begin to improve and don’t occur anymore, you are likely to have any alignment of ROM (range of motion) exercises intensified. These will also continue to build on the surrounding gluteal muscles and outer core. Depending on the exercise or sport you are involved in; your physiotherapist is likely to assess your current state and decide as to whether you are in a fit and ready state both physically and mentally to return back to said activity. This final stage of rehabilitation should be considered as important as the earlier stages to prevent any risk of regressing. Although it is not possible to stop a vertebral disc from degenerating, it is possible to slow down its progress and limit the occurrence or severity of back pain. Failure to comply adequately to rehabilitative procedures is usually the main cause of reoccurrence. During this stage, it is essential that you have regular check-ups with your physiotherapist to ensure that the biomechanics of the spin and pelvis are in good order. The importance of exercising regularly can also not be taken for granted in preventing a reoccurrence. Simple activities such as swimming, light jogging or palates can go a long way in keeping the back in good shape.